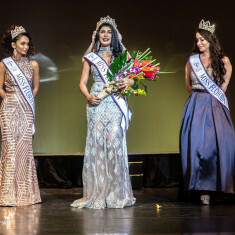 QUICK JUMP: Contestants Pageant Information How to compete in Miss Florida Earth United States 2018? The winner of Miss Earth United States age 19-26 will advance to the internationally televised Miss Earth competition. The winner of Teen Miss Earth United States age 15-19 will advance to Miss Teen Earth International. Winners in the Junior division age 12-15 and Elite division age 26-34 will receive ALL-EXPENSE PAID international travel opportunities to support their sister queens during international competitions, as well as other prizes. The Junior winner may opt to receive a $1,000 college scholarship instead of traveling. How to compete in Miss Florida Earth United States?